Sometimes when out junking you have to get down and look behind things and that may mean getting a little dirty. I spied this ironstone sugar bowl on our little weekend getaway on a bottom shelf sitting in one of the outdoor spaces at an antique/junk mall. As you can see it is covered in filth. The inside was disgusting, but I figured it would wash up well. There was no price on it so I took it in and asked. At first I thought the man said FREE, but then he held up three fingers. Even a patron standing there thought he said free, too. THREE was still a great deal! Best deal I have gotten yet on ironstone. As you can see a little soap and water and it is all clean. I was surprised when I went to put it in the hutch to see that I already had the creamer and the gravy boat by the same maker. Love when that happens. I found a few other things and will share those soon such as the quilt that is underneath. What have you gotten down and dirty to discover? BTW, I also did something stupid on our trip. I left a pair of jeans and two shirts in a drawer. Mr. Savvy usually checks behind me, but this time he didn't. Please tell me I am not the only one who has done this. He is not driving back six hours to get them. Thanks so much for the kind comments about my grands. if you call the place you stayed they'll mail them to you. What a great find! And you have matching pieces! $3 is great.....Free is heaven!!!! $3??? wow! that is a great price...comparing to the prices at the Factory in Franklin! I bet that man haa no clue what ironstone is! he is probably happy he made $3 out of it. Pretty ironstone pieces!! My mom has the whole set of those dishes with everything that goes with them. I'm so hoping she gives them to me one day. I love ironstone pitchers...plus other white pitchers too. Super find. $3. is a great price, but yeah free would have been better :D I have the tea ( tall , so maybe chocolate) pot to your creamer, sugar and gravy boat. I have been unable to find any other pieces and I have looked. I did score a few weeks ago on a little ironstone tea pot at a sale for .25 cents though. I was so stoked. I grabbed a basket as well, she said that was a buck. LOL..
What a lucky find- and to thin k it completes your set, how awesome! Yes I have sooo left things behind....but usually the concierge will mail it back. What a great find and deal!! It's a perfect match to your other pieces. I love that quilt too! We've left things behind but have been lucky enough that they've been mailed to us once we discover our mistake. I'm away right now and I will be triple checking that we don't leave anything here! Usually a charger plugged into the wall!!!!!! Yes, had that happen once on a disastrous trip when our child was 9 months old. Called the hotel and they UPS'd it to us. Annoying but worth the money and no driving involved. free or three is just about the same thing~total score!!! Love your ironstone. I don't go junkin' enough to score such great things. I am curious about that great quilt. I left one of a favorite pair of shoes in a hotel in New Orleans. Like you, my husband is so OCD that he usually checks. Great find Kim, now you have a collection within a collection! And uh oh about the clothing, couldn't they mail them to you? P.S. Your Nashville grands are SO cute!!! No, you are not the only person to have left something behind. Last Christmas, I left my pajamas hanging on the bathroom door while traveling. Pj's and jeans are easy to replace! Love your Free I mean 3 dollar ironstone purchase. What a bargain. Can't wait to get a better look at the quilt. I have left things before at a hotel, I just call them and have fedex do a pick up for me. Has worked every time. The items were always returned to me. that is such good luck, having match what you have already. I waded through a very messy pile of stuff at an out door estate sale to retrieve two vintage hat boxes, almost stepped in dog poop! (the hat boxes were beautiful condition)!! 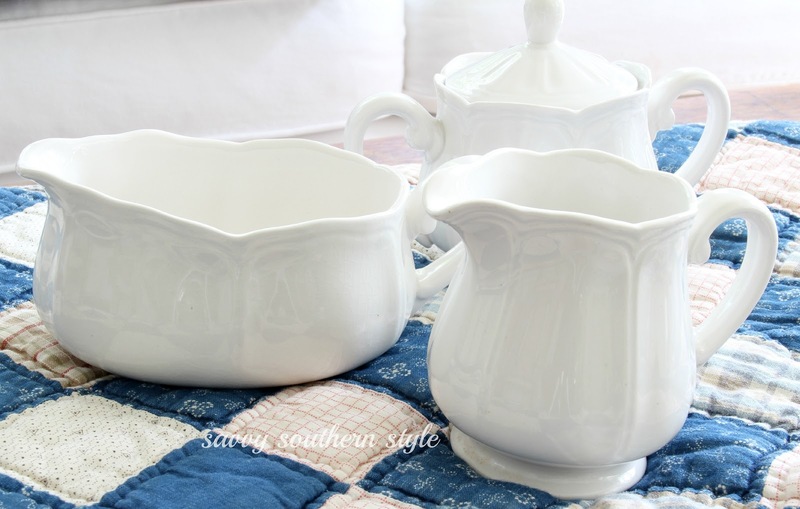 You were so lucky to find the missing sugar bowl that matched that creamer! Wow! What were the odds of that? Now you have a complete set. Gosh, I hate to hear that you left clothes behind. I have to say, that has only happened to me once. It was a white nightgown that matched the sheets on the bed. I didn't realize I left it until I got home. I usually don't unpack my luggage. I keep everything in the suitcase as I use it. Great find! I have that same set.But you got a much better deal on it than I did! Fabulous price for the sweet creamer. I once bought a greasy, dirty yellow urn at an estate sale. I could not tell if it was chipped it was so dirty but it was two dollars and when clean it was unchipped, beautiful and a McCoy. Such a sweet deal! Way to go! I love your sugar bowl!! Great price too! I left a whole piece of luggage one time and didn't know it until I went to wear something and couldn't find it! When I called back, the person on the phone couldn't believe that I couldn't describe the piece of luggage, but I didn't know that I left the whole piece, I was just looking for my pants and blouse! She did finally agreed to send the garment bag to me! It happens to the best of us! I left my Ipod at an airport hotel the night before we took an early flight out of LAX. I didn't realize it was missing until I wanted to use it on the flight. I was so happy when we came back home and the hotel was able to find it in the (from what I understood) large lost and hoping to be found items. Love your ironstone find! You are so right, you have to look around. I purchased a fabulous plate at an estate sale that was out in the garden covered in dirt...for $1.00. Not only was it a great deal, you have the matching creamer. Way to go! Can you have the hotel mail your clothes back to you? Fantastic find! I love getting down and dirty to the best deals! Lucky you to find the match and it doesn't look like it has a chip or crack and to have the lid an extra treat. Great piece! And how neat that you already had the coordinating pieces! Adorable piece! The sugar bowls are usually harder to find...and at $3, you can't go wrong! Great find! My hubby has left items in the hotel on business trips and most of them were kind to ship it to us in the mail....Hopefully they would do that for you! Have a great day!! GREAT deal on the sugar bowl!!! Nice that you already had other pieces to match!! Recently I left clothes in a hotel. When I called their office, the maid found them and turned them into the office. They were kind enough to drop them off at a FedEx location down the street. All I had to do was call that FedEx location, give them my address, pay the shipping fees and I had them the next day. This really motivates me to get out there. What a great find. I love bargains like that. It's serendipity! Try call the place you left your clothes -- I have done that, and sometimes they will be nice and send them to you. I love when I find pieces to match what I already have. Great score! Love if you'd share it at Frugal Treasures Tuesday! Have a good week. Your ironstone sugar bowl is charming! I hope you get your clothes back. Once I accused my husband of losing the Garmin on a trip...he said I must have lost it. We were bummed. In any case, it was gone. Several months later, we found it, safe and sound AT HOME. In the closet., mind you. I love all your white ironstone. 3 is a great deal. I have gotten very down and dirty to get a great junky deal. Those pieces are beautiful Kim! If I keep my new hutch I will have to certainly find me some to display! These are great Kim! Thanx for sharing at Treausre Hunt Thursday!